Hibiscus syriacus: A small white flower with a deep red center. 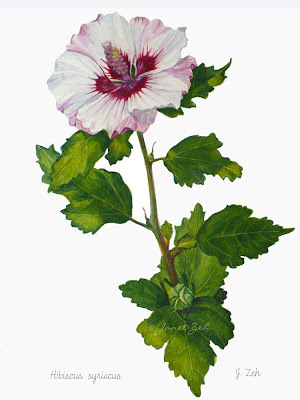 Rose of Sharon Botanical print comes in several sizes and print options. Click the Order Print button below for sizes, options and prices. Also available as an original painting in watercolor size 15x11 inches - $295. Please contact me to purchase the original.